Due to overwhelming turnout at our first tournament (and the weather,) we are forced to cancel our additional tournaments this weekend. 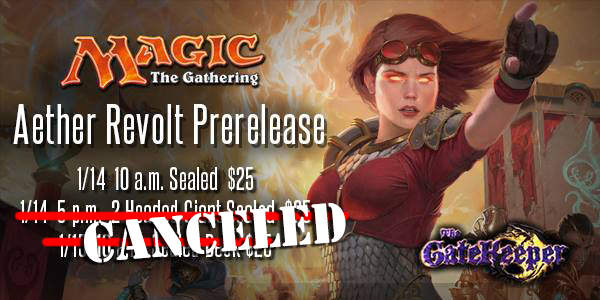 We apologize for the inconvenience, but we allocated on our product by Wizards of the Coast and with so many players turning up for the first tournament, we simply don’t have enough packs for any further events this weekend. We want to thank everyone for showing up for the first tourney. We have increased our orders and will have Aether Revolt boxes on Friday!